The CCSS products are installed with their own user profiles on the IBM i. The following sections describe how to change the passwords for those user profiles. There are various reasons for such a change, for example, a change to security policies that makes a longer password necessary. There are three steps involved in changing the product passwords. For older product versions, changing the product configuration. Changing the user profile’s password using the command CHGUSRPRF. In some cases, updating the PC software settings to reflect the change. Use the CHGUSRPRF or WRKUSRPRF commands to manually set the password for the QMessage Monitor user profile on all boxes. Note: If you have a solution, such as Safestone User Profile Manager, that allows you to change passwords centrally, use that solution instead. Complete the steps in the following sections to set the passwords for the QMessage Monitor and QRemote Control PC software. 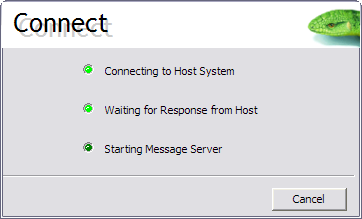 On all PCs where the QMessage Monitor user profile (MM by default) is used to connect the PC software, start the Console or Maintenance PC module, but during connection click the Cancel button. 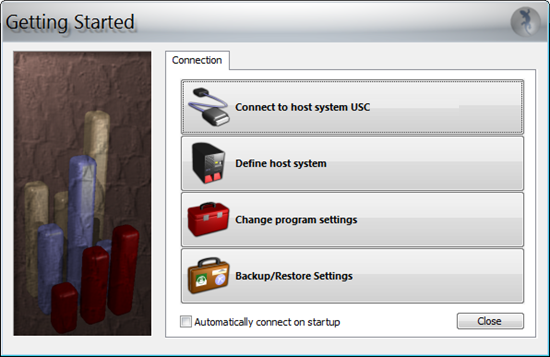 Select Monitor > Change Host from the File menu (the round button). Set the new password in the window that opens. Either set only the new password, or change both the user profile and the password used to connect, as shown below. Note: As a best practice, we recommend that you use your own user profile to connect to the IBM i, instead of the product user profile. Important: If you use the QRemote Control Service instead of the “normal” QRemote Control module, perform the following actions in the QRC Client instead of in QRemote Control. 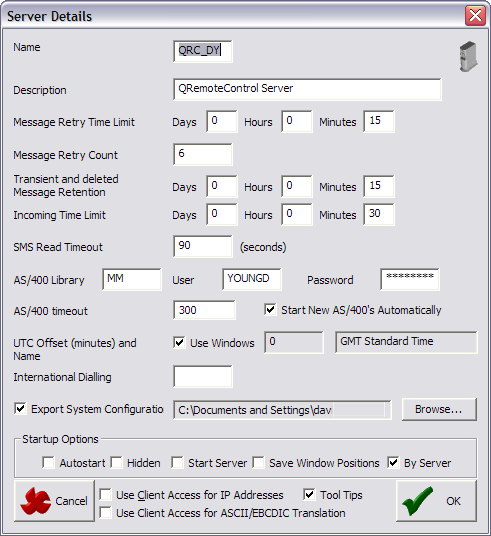 On all PCs where the QMessage Monitor user profile (MM by default) is used to connect the QRemote Control PC software, start the QRemote Control PC module and click Configure to set the default password. 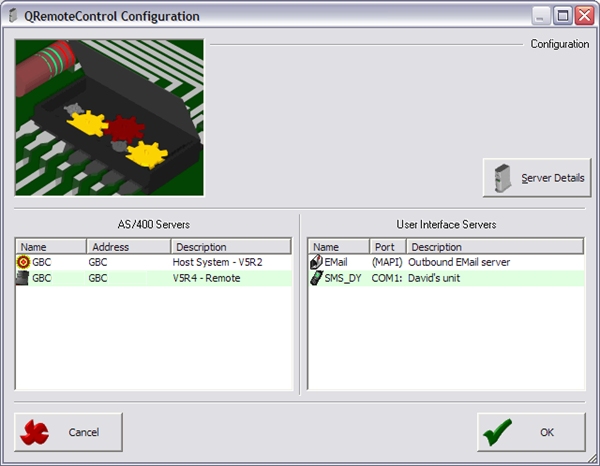 Note: If the QRemote Control servers are already active, you need to first stop all QRemote Control servers. Click Server Details. In the following screen, note that the default user and password have been changed from the default values. Either set only the password, or set both the user name and the password. 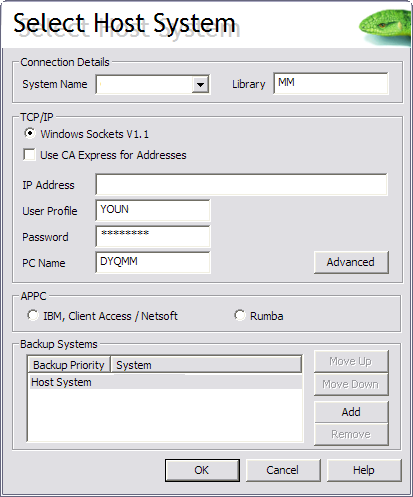 Note: As a best practice, we recommend that you use your own user profile to connect from the QRemote Control PC software to the IBM i, not the product user profile. Start the QRemote Control servers. If you were using V12 or lower of QSystem Monitor in the past and are now using V13, on the host system, ensure data area MONUSRPRF in the product library is set to the value *CURRENT. 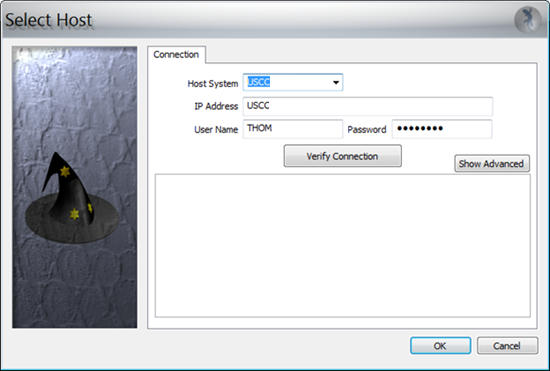 Use the CHGUSRPRF or WRKUSRPRF commands to manually set the password for the QSystem Monitor user profile on all boxes. Note: If you have a solution that allows you to change passwords centrally, use that solution instead. Follow the steps in the next section to configure the new password in the QSystem Monitor PC software. If the screen is not displayed, restart the module, but press the Shift key while it's starting. Either set only the password, or set both the user name and the password. Note: As a best practice, we recommend that you use your own user profile to connect from the QSystem Monitor PC software to the IBM i, not the product user profile. Click OK to save the new settings. 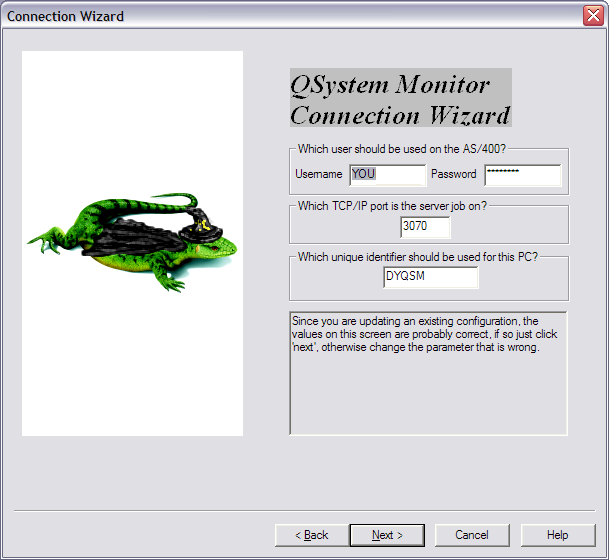 On all PCs where the QSystem Monitor user profile (MSM by default) is used to connect the PC software, start the Connection Wizard module to set the default password. When the following screen appears, enter your new password into the Password field. Follow the rest of the steps in the wizard to create a new defaults file (Dflts.msm).